Bus from Kuantan to Dungun is the cheapest and most convenient way for locals to travel from Kuantan to Dungun Terengganu. In the condition of no competition from train and flight services, bus becomes the only option for travellers and tourists to travel between the two cities. Transnasional, Perdana Express, Kesatuan Express and Maju Express are the few well-known bus operators serving bus from Kuantan to Dungun. The first bus service starts in the morning 9:30am and the last bus service leave the Kuantan Sentral Bus Terminal at midnight 1:45am. Perdana Express is the largest player among them by providing 4 daily departures from Kuantan to Dungun. Perdana Express Coach fleet used in this service route is double deck VIP coach while other operators is using single deck VIP coach. All the coaches serving this route is conditioning with seat arrangement of 1 on the left and 2 on the right. VIP coach seat layout provides spacious seating to passengers so that they can have comfortable journey from Kuantan to Dungun. The duration required from Kuantan to Dungun takes about 2 hours depending on traffic condition. The bus fare is ranging from RM 12.20 to RM20 depending on the choice of the bus operator. 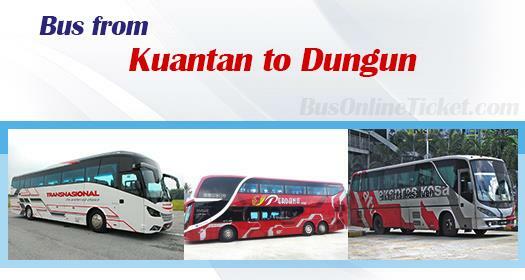 The boarding point for bus from Kuantan to Dungun is at Kuantan Sentral Bus Terminal while the arrival point in Dungun is at Dungun Bus Terminal. Washroom break will be provided upon request to driver during the journey. BusOnlineTicket.com offers the most flexible and convenient online bus booking service to the users. You can book bus ticket and make payment via BusOnlineTicket.com with just one click. BusOnlineTicket.com has emerged as the trustable and reliable portal among its customers throughout these years with consistent excellent service.